"Holy sheez, what an idiot." This was a big weekend for the Monster Energy NASCAR Cup Series. Not only was it the NASCAR Playoffs but they were also at Talladega, a place where anything could happen. This Talladega race was also special for Dale Earnhardt Jr. and Dale Jr. fans as this was likely Dale Jr.’s final race. Many claim this was Dale Jr.’s best chance to win a race before he retires and he certainly did his very best to do that, avoiding multiple crashes. Dale Jr. would be one of the lucky 12 or so drivers who was running at the end and eventually finished 7th. While his race didn’t end in Victory Lane, Dale Jr. was probably relieved that his race didn’t end with a hard crash and risk another concussion. For many others, they were caught up in multiple crashes throughout the day. It was a crash fest that didn’t yield many to be running at the end. But when the race finally completed, Brad Keselowski got the win and a spot in the next round of the playoffs. The first crash of the day happened when Jamie McMurray didn’t get down low enough to pit and slowed down while on the track. And when cars are coming up behind you at full speed, it’s not a surprised that he was drilled in the back and ended his day. In one of the few one-car crashes, Trevor Bayne blew a tire and got into the outside wall. That didn’t mean he was the only car that was damaged. Dale Earnhardt Jr. did get into the back of Daniel Suarez as everyone was slowing down but his damage was fixed. 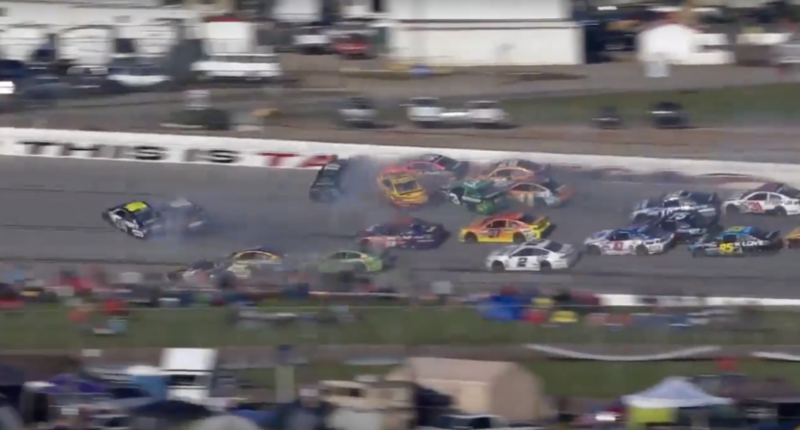 And then after another crash, Clint Bowyer really got into it with his crew after blaming them for putting him in the back and getting caught up in the wreck. After his crew chief was having none of it, Bowyer pulled into the pit, the two got in each other’s face and Bowyer cursed and walked away. The Big One, well the big Big One happened with 17 laps to go and most of the contenders were taken out. After that crash, there wasn’t too many cars left. People weren’t done wrecking as two other crashes occurred after. The first, which involved Joey Logano, Ryan Blaney and Trevor Bayne, provided another scare for Dale Jr. and his fans. In the end, Brad Keselowski wound up really surviving, much less winning. But he got the checkered flag at the end of the day for his fifth win at Talladega.